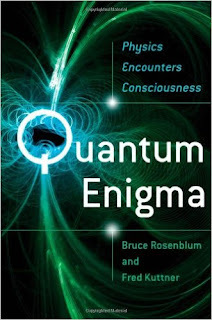 Last summer, I read a booked called Quantum Enigma: Physics Encounters Consciousness . I am not a physicist and don't pretend to be one. But I was recommended this book by a co-worker and found it on kindle and read it from my phone while traveling to and from work. It is not the easiest book to read and I skimmed through most of it. However, the material is presented in such a way as to make a very esoteric and complex topic "easy" to understand and read. With the advent of quantum mechanics, physics found that observation created a physical reality. By freely choosing a different observation, you could have created a physical reality inconsistent with the one you actually chose to create. (And therefore a different history!) Though, because of randomness and the complexity of big things, you can’t bring about just the future you want—as purveyors of pseudo-science imply. Quantum mechanics reveals a mysterious encounter of “free choice,” conscious free will, with the physical world. Does this impact your world-view? It sure does impact mine. What this book is basically saying is that brightest minds of our time (Max Planck, Niels Bohr, Stephen Hawking, Albert Einstein, and Erwin Schrodinger) have proven quantum mechanics theories but have struggled with consciousness and how it affects it. What all this means is that more than ever, it is imperitive and extremely important to only think, speak, write and feel in a positive, loving and peaceful way. YOU ARE LITERALLY WHAT YOU THINK AND BELIEVE!! I hope this isn't too confusing...it is difficult to simplify such a complex topic in a few paragraphs.